Dubai, UAE, October 02, 2018: Dehydration, uneven skin texture and aging are some of the most common skin issues for many of us, usually the result of several internal and external factors such as excessive sun exposure, pollution, unbalanced diet and not drinking enough water. While it might be difficult to avoid the external factors and implement drastic changes in our busy lifestyles, the use of the right skincare products can help solve these major skin concerns and promote youthful skin. 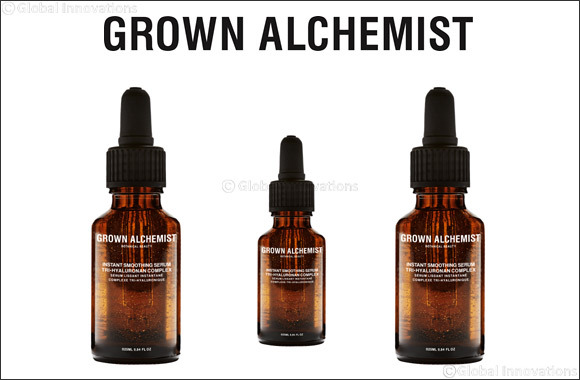 Award winning Australian beauty brand Grown Alchemist has just launched its Instant Smoothing Serum, formulated using a complex-combination of plant-derived and low weight Hyaluronan molecules. This innovative and anti-aging serum delivers an instant lifting effect, intense hydration and rapid smoothing of skin’s surface. When used regularly, this serum acts as anti-aging booster serum, as it helps prevent dehydration and the formation of fine lines and wrinkles. This Instant Smoothing serum is ideal for use as an intensive treatment to counteract the effects of environmental exposure including sunburn, heating or air-conditioning, or it can be combined with other skincare products for maximum hydration and lifting of the skin. Not to mention that it can be used as an instant plumping and priming treatment before an evening out. Grown Alchemist’s new Instant Smoothing Serum is available in the Middle East from October 2018 priced at AED 375 and is available for purchase in Harvey Nichols, Bloomingdales and online on Beautifulbrands.ae.